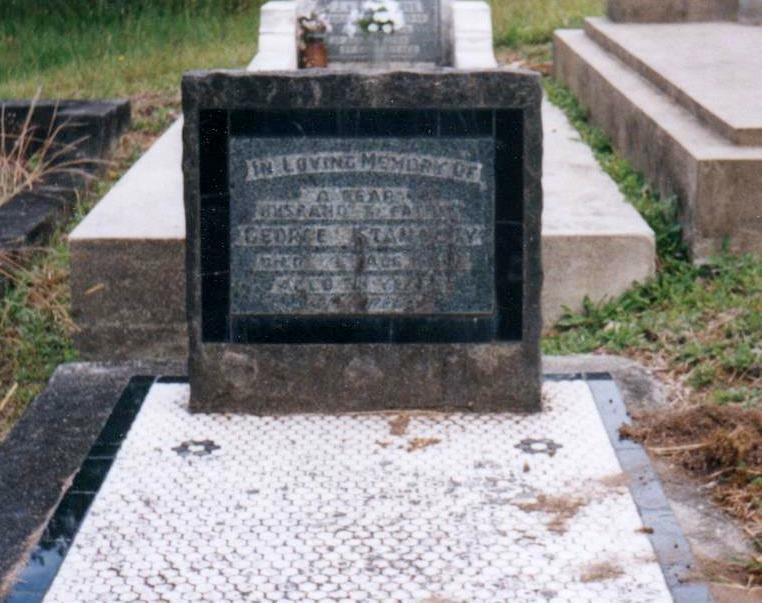 Charles George Stanaway (George Stanaway) was born 9 October 1864 in Northern Wairoa, Northland the first son to John James Stanaway and Sarah Anne Clark. (Birth Certificate No. 1864/7784). Charles George Stanaway – Colleen Stanaway Collection. Not much is known about his early life. 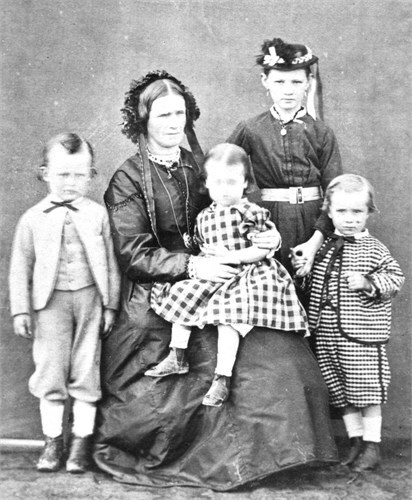 A photo has been published of him as a child with his Grandmother Dinah Clark and Elizabeth his half-sister and his cousins on his mother side. George Stanaway, Dinah Clark, Elizabeth, Richard Clark and Dinah Paton on knee. He was only 10 when his father died and 12 when Sarah remarried George Sanders. He is reported to have spent several years in coastal vessels then abandoned the sea in favour of the land. Charles spent several years as a seaman before taking up with farming in Gisborne district, then returning to the Kaipara and finally becoming the Proprietor of the Pahi Hotel. Before the same Court, George Stanaway was charged by Marmaduke Holdsworth with assaulting him. The case was clearly proved and admitted. Defendant, in extenuation, pleaded that a fight was going on between two other men, one of whom was drunk. Plaintiff was also drunk, and defendant thought he was going to help in the fight, and struck him to prevent it. He was sorry for what he had done, and made an ample apology. Plaintiff denied that he was drunk, but was willing to accept the apology. The case was settled by defendant paying all expenses. From the Electoral Roll of 1890 we have two records one record of George living in Tokatoka and the other in Dargaville, in both he is listed as a Bushman. Charles’ Birth Certificate – Colleen Stanaway Collection. 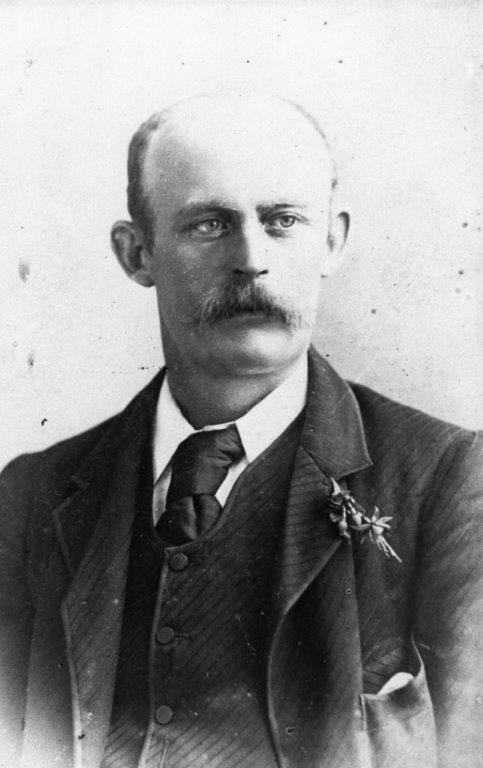 (The 1896 Electoral Roll has a George Stanaway at the Wharf Hotel at Thames in the Waikato, listed as a miner – we are not sure if this is our George). He farmed in Gisborne for some years before returning to the Kaipara. (Source – article by Allan Kirk in the NZ herald in 1969). This may be where he met Elizabeth Emily. Her father’s family were from the Napier/Gisborne area. Charles and Elizabeth’s marriage Certificate – Colleen Stanaway Collection. 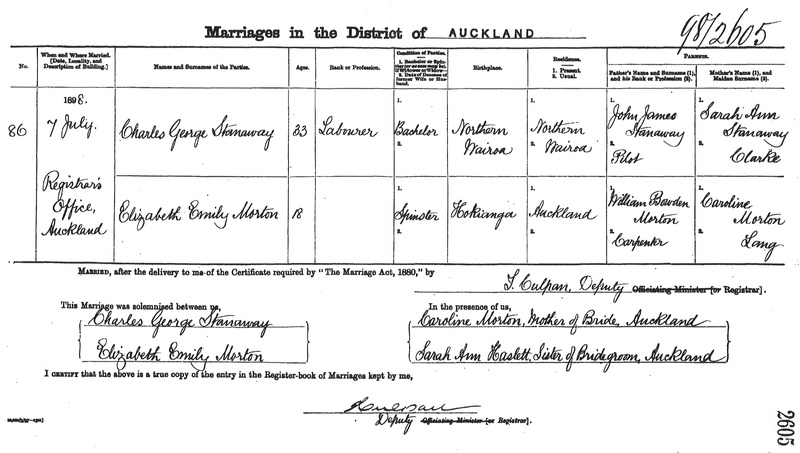 George married Elizabeth Emily Morton (Emily or Sissie) on 7 July 1898 in Registrar’s Office, Auckland (Marriage Certificate No. 1898/2370). The witnesses were her mother Caroline Morton and Sarah Ann Haslett nee Stanaway – sister of Charles. Elizabeth was only 18, Charles was 33 when they married. (George’s cousin Stella married Graham Morton, Elizabeth’s younger brother). Charles George Stanaway and Elizabeth Emily Morton had 13 children. On 11 May 1899 William John (Bill) was born in Auckland. George’s occupation was listed as a labourer. In 1899 with a bullock team, George cleared and then farmed 270 acres at the end of the Hoanga peninsula (also known as Graham’s Fern). They milked cows and fattened pigs. The cream was collected from the wharves dotted along the river banks by the cream boat and taken to the factory in Mangawhare. 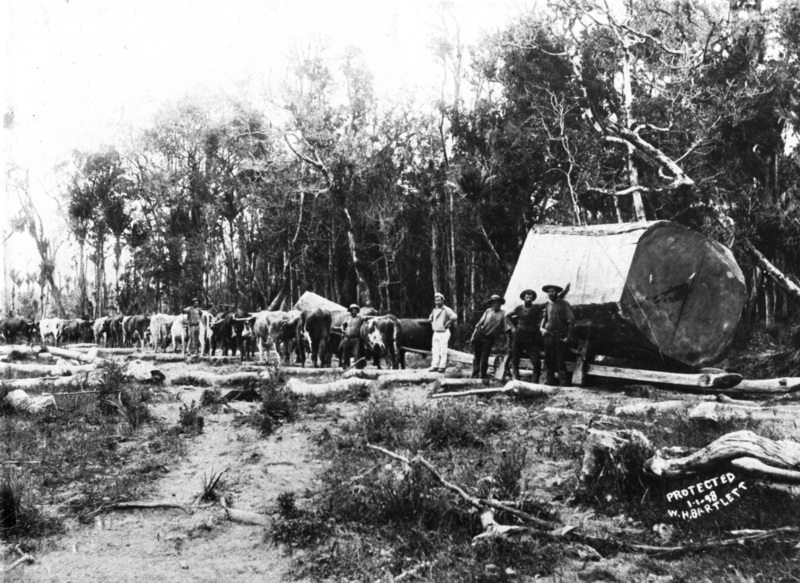 Hauling Kauri Logs George’s bullock team about 1898 – Colleen Stanaway Collection. 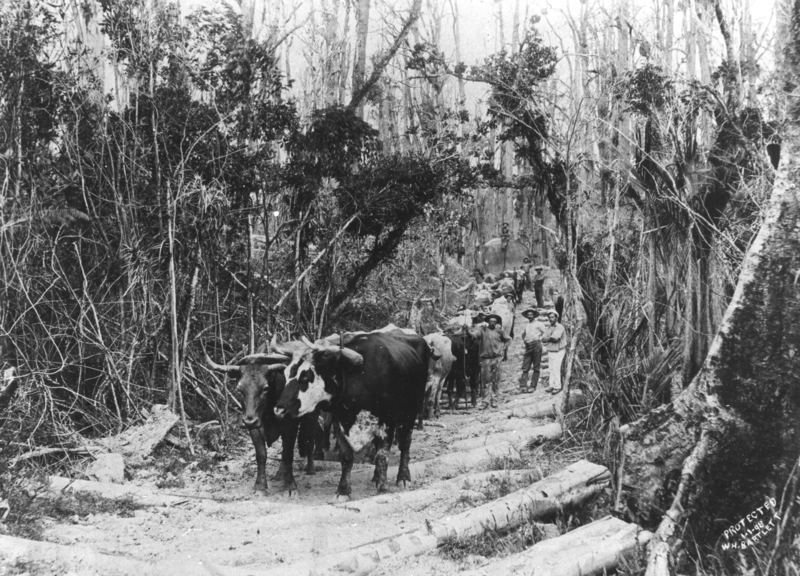 He used his team of 18 bullocks in the bush dragging kauri logs at Strugglers Gully Tangowahine, across the Northern Wairoa River from his farm. The 1900 Electoral Roll has Charles George living in Dargaville and listed as a Bushman. On 13 Jul 1900 a second son, Charles (Charlie) was born in Omu. George’s occupation was listed as Bushman. C. George Stanaway v. W.Allen: Claim, 11 pound odd, for kahikatea logs, short delivered. After lengthy evidence was given, the Bench said defendant ought to have refused to but his brand on the logs till they were delivered, or have stated that he simply branded to identify them, and not as taken delivery of them. Judgment for plaintiff for 11 pounds and 12 shillings with costs. Two years later on 13 May 1902 Percy Henry (Harry) was born in Tangowahine. Again George is listed as a Bush contractor. On 26 Nov 1903 in Omu – Stanley John (Jack) the fourth son is born. His father’s occupation was again listed as a Bush contractor. The 1905-6 Electoral Roll has Charles G Stanaway again is Dargaville and listed as a Bushman. 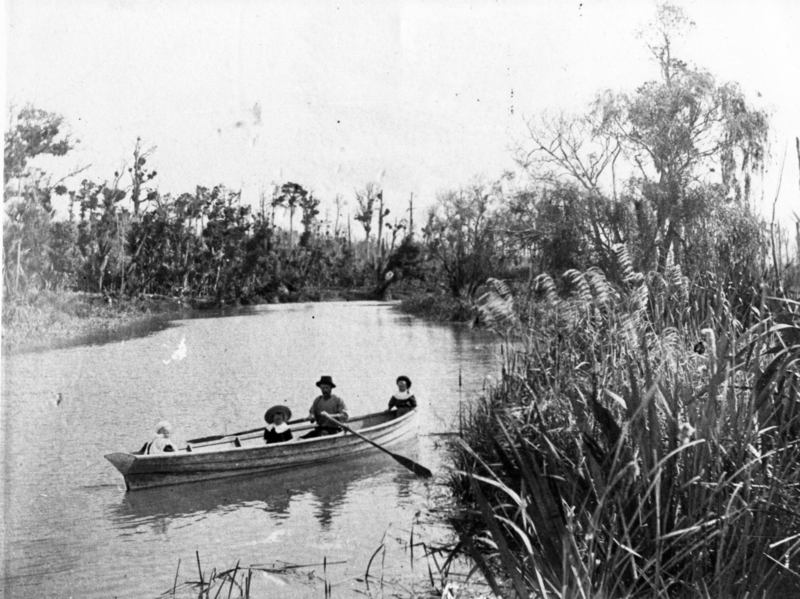 George and we presume his 3 older children, Hoanga about 1903 – Colleen Stanaway Collection. A fifth son Frederick James was born on 13 Aug 1907 in Rehia. George’s occupation still listed as a Bush contractor. What is known is that huge quantities of timber were put through the Hoanga Mill between 1907 and 1913. Originally, supply came from Omana, from Mapuna (where George Stanaway had a contract for 2 million feet on McCronin’s property), from Beasley’s Landing…. Mr G Stanaway of Okahu completed a big contract in supplying the Tangowahine Mill with timber. He also undertook a contract to supply the Hoanag Mill with 2,000,000ft of kahikitea, rimu and kauri from Mr McCronins property at Mapuna. On 30 January 1909 his mother Sarah’s Probate granted, Charles George Stanaway and George Edward Sanders Jnr to inherit a farm at Raupo held under lease or licence. Everything else was left to Sarah’s husband George Sanders. On 31 May 1909, George and Elizabeth had twins a girl and boy, the first was their first daughter Margaret Eileen (Irene) and then Clarence Bowden (Clarrie), both born in Rehia, Northland. G Stanaway is well on with a white pine supply at Mapuna. The 1911 Electoral Roll again has George in Dargaville and listed as a Bushman. A second daughter, Phoebe Josephine was born on 30 September 1911 in Dargaville. George’s occupation is listed as Contractor. Then on 24 December 1913 in Dargaville, another set of twins (2 boys) were born Patrick Nolan, he was the eldest of twins and the Robert Winsten (Bob). Again their father’s occupation was listed as Contractor. The 1914 Electoral Roll has George still in Dargaville and listed as a Bushman. Grahame Morton was then born on 5 February 1915 in Dargaville, George’s occupation was listed as Contractor. Sadly on 2 June 1915 Clarence the younger of the twins died. Yet another son, Rex Leith was born on 28 March 1917 in Dargaville. Father’s occupation Bush Contractor. This same year but in April George is mentioned in the NA paper (16 April 1917) having picked up a contract to fell and deliver 5,000,000 feet of white pine in the Awakino Valley. The last of George’s children, Collings (Colin – but he grew up thinking his name was Colin George) was born on 3 September 1919 in Dargaville father’s occupation Contractor. The 1919 Electoral Roll has George still in Dargaville and listed as a Bushman. Mr George Stanaway had a terrible experience at Hoanga North Wharf on Saturday night. He was landed on the wharf from a river steamer and after the steamer left he slipped and fell into the river, striking his leg, back and head. He managed to cling to a willow branch alongside the wharf and commenced to call for help. 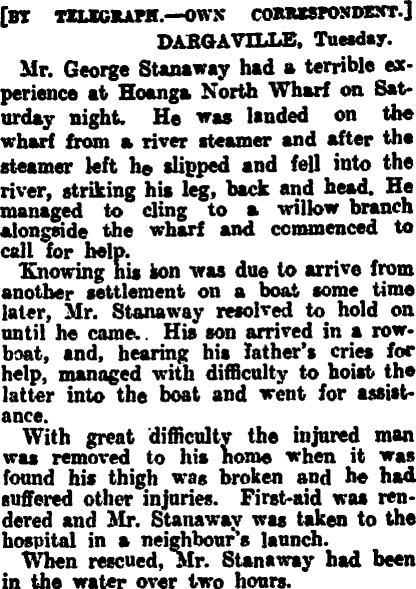 Knowing his son was due to arrive from another settlement on a boat some time later, Mr Stanaway resolved to hold on until he came. His son arrived in a rowboat, and , hearing his father’s cries for help, managed with difficulty to hoist the latter into the boat and went for assistance. With great difficulty the injured man was removed to his home when it was found his thigh was broken and he had suffered other injuries. First aid was rendered and Mr Stanaway was taken to the hospital in a neighbour’s launch. When rescued, Mr Stanaway had been in the water over two hours. His hip never healed properly. George needed a walking stick and Sissie managed the farm until 1926 when it was sold. In 1926 George purchased the pub at Pahi (License transferred on 21 April 1926) and moved the youngest of his family. It was a large 2 storied building right on the water’s edge. Pahi Hotel as it is today. His son Harry used to visit by boat and beach it on the foreshore. Noel, Grahame, Rex and Colin and two of their nieces Clarice and Melva (Bills children) attended Whakapirau School on the other side of the harbour. The teacher used to board with them and would row them to and from school. George had a barometer which he used to check every morning. The children would often hold a lit match behind it. When he checked the barometer and the temperature and would tap the glass they would laugh and run away knowing he couldn’t run after them. They would all climb out through the windows, down the fire escape and into a dinghy and then row out into the channel where he couldn’t reach them. Colin, being the youngest was often caught as he was the last one out of the window. He remembered his father as being quite stern, maybe because of the pain in his hip. The barometer is still in family possession – the scorch marks can still been seen on the back. The actual workings were replaced some years ago, this probably makes it difficult to date – It would be interesting to know whether it was JJ’s originally. G C Stanaway the Licensee of the Pahi Hotel was fined 5 Pound for keeping licensed premises open for sale of liquor when they should be closed. 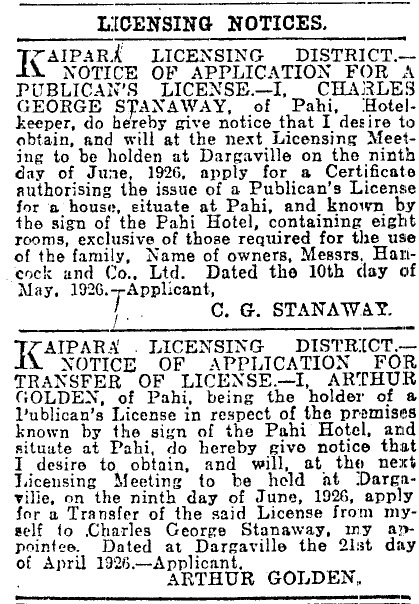 The 1928 Electoral Roll had George now living in Pahi and listed as a Hotel-keeper. In the same year there was a Court case after local farmer and his son (the Skelton’s) were charged with assaulting George’s son, Frederick James at Pahi. It was alleged that Charles George Stanaway used insulting and provoking language to incite Thomas Skelton to commit a breach of the peace. The result was that Skelton was convicted and all other charges were dismissed. 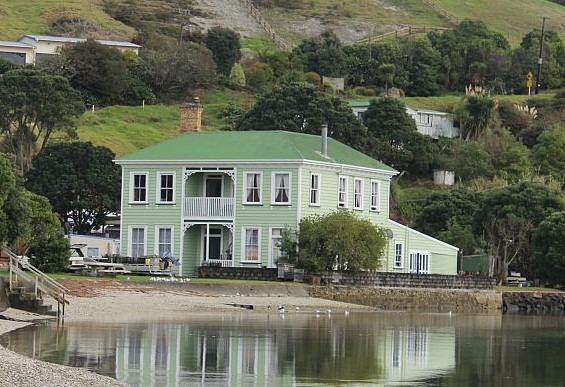 In 1930 after only four years in running the Pahi Hotel, due to the depression, the business was sunk by bad debts. The family moved to Auckland. By this time George was a semi-invalid so Sissie went out and gained work as a cook. George’s Gave site – Mt Wesley Cemetery, Dargaville. Charles George Stanaway died on 4 August 1940 in Northern Wairoa Hospital, Te Kopuru (Death Certificate No. 1940/15106). He was buried at Mt Wesley Cemetery, Dargaville on 6 August 1940 Block 4 Lot 199. Death Notice – New Zealand Herald. Gravestone – In memory of a dear husband and father George Stanaway Died 4/8/1940 Aged 78 years. At Peace. Emily’s parents were William Bowden Morton who was born in Leith, Scotland in 1851 and died in Auckland on 20 November 1939 (an interesting fact about William was that at the age of 17 he fought with the Napier volunteers at Te Mahanga near Gisborne against Te Kooti). Elizabeth Emily Stanaway nee Morton – Colleen Stanaway Collection. Her mother was Caroline Lang nee Hill (born about 1851 possibly on Waiheke Island – death date unknown). 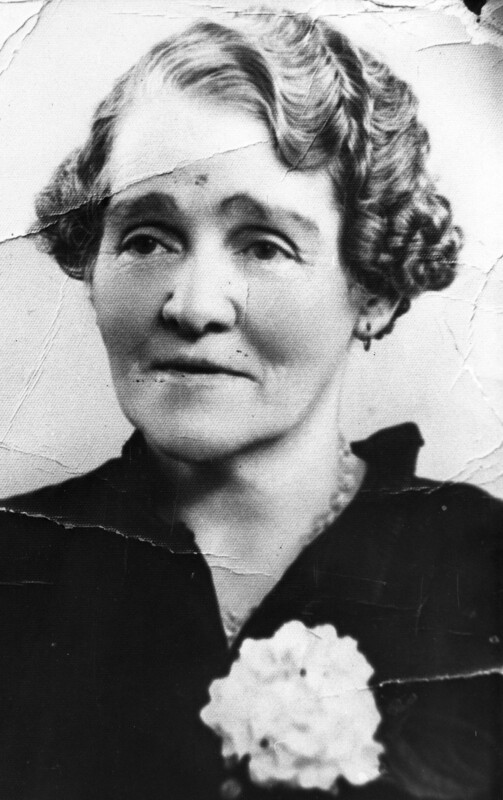 Emily was born on 10 Feb 1880 in Kohu Kohu, Hokianga, Northland. (Birth Certificate No. 1880/312). Elizabeth, as a young girl spent time in Fiji with family, where her father was involved in the pine plantations. The Electoral Roll of 1938 has Elizabeth living in Auckland at 22 Kipling Ave, in the district of Eden, our last record of her is from the 1946 Electoral Roll where we have her being registered this time in the Waikato, 3 Norten Road, Hamilton – widow. 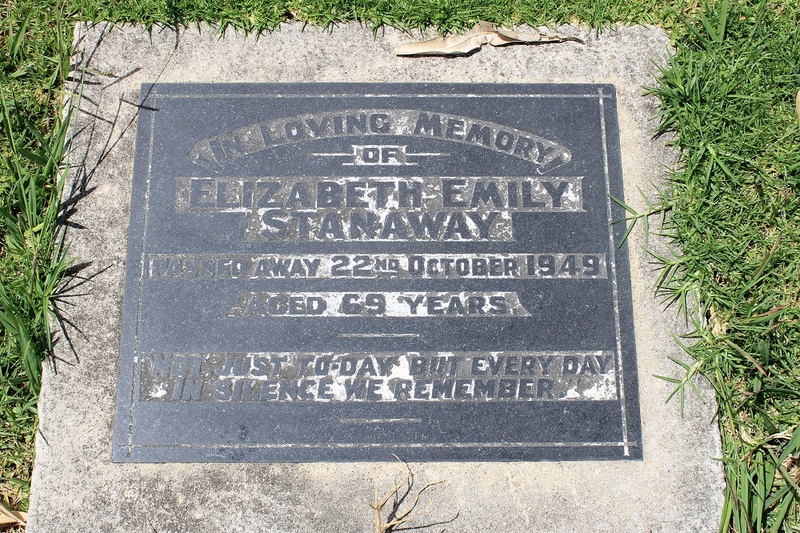 Elizabeth Emily Stanaway lived a further nine years after her husband, and died on 20 October 1949 (Death Certificate No. 1949/27405) in Newmarket, Auckland and is buried at Waikaraka Cemetery, Onehunga. Elizabeth’s Plot at Waikaraka Cemetery, Onehunga Auckland. A special thanks to Colleen Stanaway, who has kindly provided the above information on George and Elizabeth Stanaway. there is a story that Marmaduke Holdsworth was a relative (nephew?) of Dinah Clark. Hi Colleen, I was interested in your story of George Stanaway, when he owned the Pahi Hotel from 1926 to 1930. George must have sold the hotel to my grand father Charles Edward King know as Ted, after Ted sold his farm at Whenuanui, Ruawai. The Electoral Roll for 1930 has King CE Pahi Hotel. I did know they owned the hotel for a few years. Ted nearly went broke over owning the Pahi Hotel, instead sold and shifted up river and bought a farm at Toka Tap. The farm the Mooney’s own now. Also i have seen the lovely old photos of the Pahi Hotel in 1930. I going to do an small project on Ted and his connections to his family all owning hotels in London England. Does anybody know how to contact Colleen Stanaway please?